Browse: Home / Dalai Lama – Saint or Prophesied Antichrist? Contributor KMG believes that the Dalai Lama is an Illuminati kingpin and possibly the Antichrist of Buddhist and Christian prophesy. After the Chinese Communist Party (CCP) took power in China, the Dalai Lama immediately forfeited Tibet´s sovereignty to China carte blanche. Later he went to Beijing for 11 months and spent time with the top leaders in Beijing. 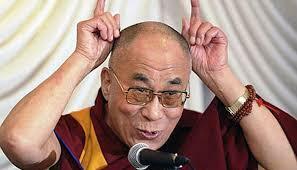 Does anyone believe that Dalai Lama knew nothing of Marxism? Mao was an errand boy of the Lamas. The lamas had supported the Bolsheviks from day one in Russia. Mao never dared do anything in Tibet until after Dalai Lama had left. The actions of Mao and Dalai Lama speak for themselves. Was Dalai Lama supported by the CIA? Yes, and he was supported by Beijing too and everything was a charade because both Beijing and the US were controlled from Tibet. The real truth about his flight suggested by Tibet opposition leaders is that Dalai Lama was scared of the Tibetan patriotic rebels killing him so he ran off to India. The Tibetans had already realized him being a real traitor.